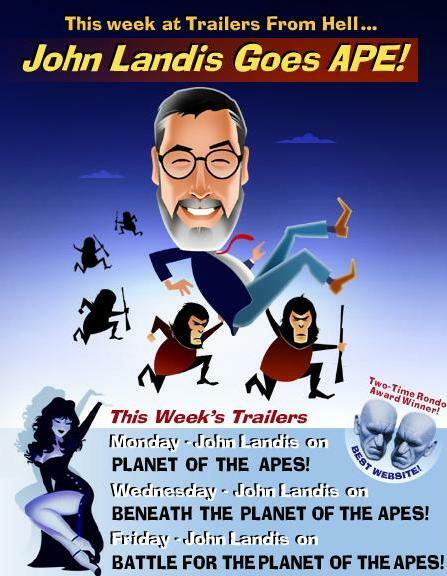 John Landis and the Apes from Hell | Critical End! Does anybody know if the upcoming Rise of the Apes is going to be a prequel to the awesome Planet of the Apes or to the lame Tim Burton’s Planet of the Apes? And while we’re at it, just why did Gorilla General Aldo want to cause an ape civil war in Battle for the Planet of the Apes? Lucky for us, the ever awesome John Landis is on the case this week as he does commentary on the first, second, and final Ape films over at Joe Dante’s Trailers from Hell. I’ve always said that I would listen to John Landis read a Denny’s menu, so to hear him talk about a series that Ryan and I killed an entire weekend watching in college is going to be beyond amazing. Schedule and link below! This entry was posted on Tuesday, February 22nd, 2011 at 7:02 am. You can follow any responses to this entry through the RSS 2.0 feed. Both comments and pings are currently closed.